Next-generation sequencing technology can provide genome-scale sequence information for a large number of species and has revolutionized evolutionary genomics. A particularly useful approach to identify the genetic architecture of evolutionary novelties is the analysis of positive selection. A frequently used method for detecting positive selection relies on the comparison of the sequence of protein-coding genes in related clades where one of the clades evolved the trait of interest, in this specific case exceptional lifespan. To date, several different mammalian taxa/clades were analysed with this approach with the purpose of identifying sequence changes associated to evolution of longevity: the elephant, the bowhead whale, bats and mole-rats [3–8]. In addition to the analysis of positive selection, other phylogeny-based methods have been used to investigate genetic changes related to the evolution of longevity, e.g. [9–12]. The different analyses delivered interesting candidate genes and pathways that underwent accelerated molecular evolution in coincidence with evolution of exceptional lifespan. A major drawback of all these approaches – including the analysis of positive selection – is that long-lived mammals are difficult or impossible to be kept in captivity and manipulated experimentally. This creates the need for a long-lived vertebrate that is small in size, easily adaptable to captive life, can be bred in large numbers and therefore could become a convenient experimental model organism. The standard evolutionary theories of aging – namely the Mutation Accumulation , Antagonistic Pleiotropy  and Disposable Soma theory  – predict that low extrinsic mortality conditions lead to the evolution of slow senescence and increased lifespan. Some examples that confirm these theories are the exceptional longevity of vertebrate species under low predation risk since they are chemically protected [16, 17], adapted to an arboreal life  or found in protected environments such as caves , respectively. On the other hand, annual fishes of the genus Nothobranchius provide an example of how increased extrinsic mortality conditions lead to the evolution of accelerated senescence and a short lifespan [20–22]. 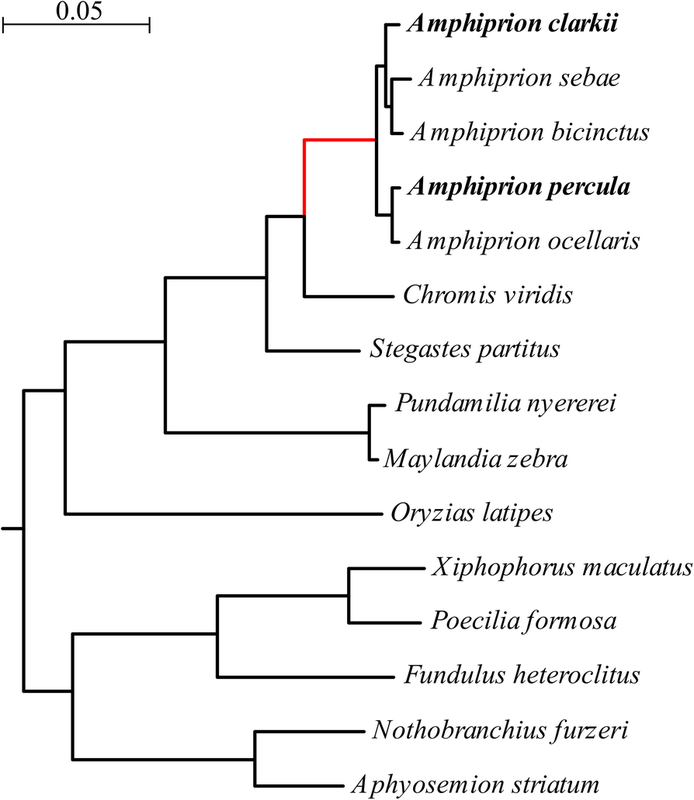 Analysis of positive selection in annual killifishes revealed a potential link between the evolution of genes governing mitochondrial biogenesis and the evolution of lifespan . All clownfish species (genus Amphiprion) evolved a specific adaptation that allows them to live in symbiosis with sea anemones. Symbiosis evolved in the last common ancestor of the clownfish and clownfish represent a monophyletic group in the Pomacentridae family (damselfishes) . In the Indo-Pacific Ocean, clownfishes are found in association with one or more sea anemone species and a large variation in host usage exists [25–27]. Fish that feel threatened by predators immediately seek protection by the anemone’s tentacles; without that symbiosis, fish are readily attacked by predators [28–30]. Therefore, clownfishes are protected from predators through the presence of anemones . Hence, the overall mortality rate of the clownfish is low as compared to other coral reef fishes or other tropical species of Pomacentridae of the same size [28, 31–34]. A total of 157 positively selected genes (PSGs) of 14,214 analyzed genes were identified in the LCA of the clownfishes (Additional file 1: Table S2). We tested for overrepresentation of gene ontology (GO, FDR < 0.1) and observed 19 biological processes enriched for PSGs (Table 2, Additional file 1: Table S3). A majority of these processes are of particular interest for aging research: altogether nine enriched processes are linked to the metabolism of xenobiotics, detoxification or glutathione metabolism, respectively. Interestingly, these processes were shown to be strongly up-regulated in experimental conditions favoring longevity such as dietary restriction and inhibition of the somatotropic axis making the animals more resistant to toxins [48–51]. Furthermore, experimental manipulation of mitochondrial translation, another enriched process, is known to increase lifespan in C. elegans  and variations in the expression of these genes is associated to lifespan variation in killifish  and mouse . We also tested formally the relationship between the results of the positive selection analysis on the LCA of the clownfishes and aging. For this, we checked whether processes whose gene expression was shown to be associated with maximum longevity in an analysis across 33 diverse mammal species , were also enriched during the positive selection analysis, which was the case (p = 0.06). Among the other 15 PSGs genes showing evidence for positive selection, both, in the clownfish LCA and in meta-analysis were, e.g., LAMP2 and CD63 (also called LAMP3) which code for major protein components of the lysosomal membrane [64, 65]. In addition, CD63 gene expression was shown to predict the malignancy grade of many different tumor types [66–70] and the artificial prevention of the decrease of LAMP2 gene expression during aging in mice results in considerably reduced cell damage, as well as in liver functions in old mice that are indistinguishable from those in young mice . 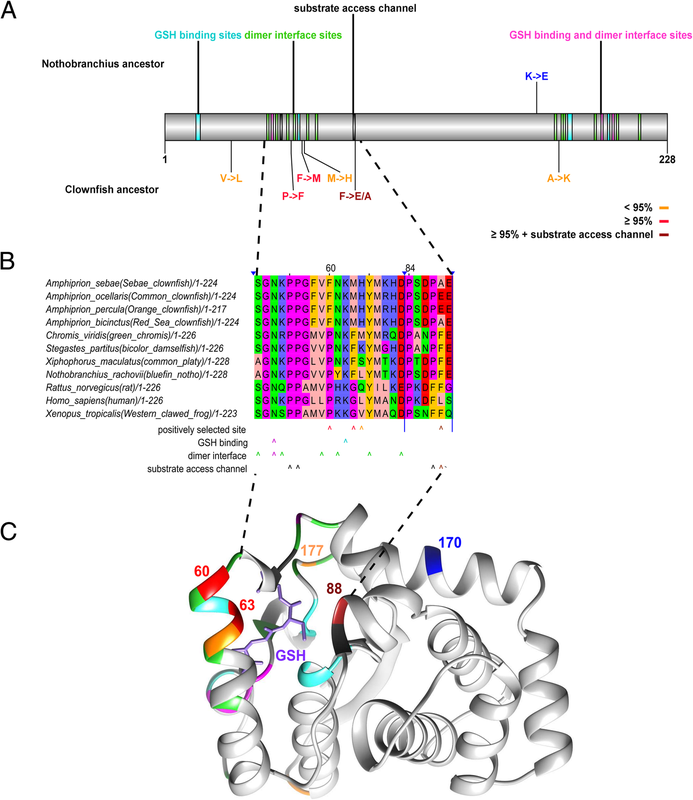 Finally, another interesting example that was identified as significant, both, in the clownfish LCA and in the meta-analysis, is GSTK1 encoding a glutathione-S-transferase that localizes to the peroxisome. 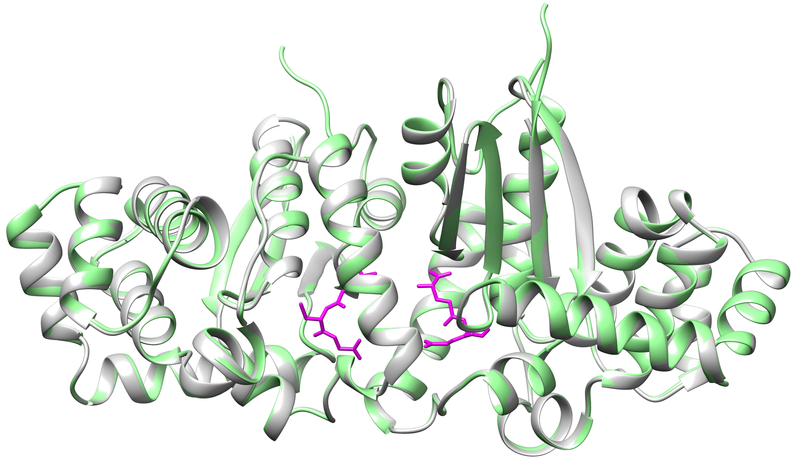 GSTK1 was shown to be associated with diabetes type 2 which is another major aging related disease [72, 73].